Lock in a great price for Holiday Inn Express Denver Downtown – rated 8.1 by recent guests! They always had fresh coffee. They are in a good location. We were only there for 1 night but the room was beautiful! The breakfast was more than I expected! I can't wait to come back and stay again! The staff is EXTREMELY helpful and friendly. This is the second year we have stayed here for the same event. Location is perfect and we park our car with valet and walk everywhere. We will stay there again next year!! The breakfast was excellent-- one of the best breakfasts I've had a quite a while. Also, the staff was very nice and professional. The hotel is located right downtown-- it's easy to get to because it's one block off 16th St, which has the free bus from Union Station. The actual hotel in Denver was wonderful; it was the booking process that was horrible (see below). I liked being able to walk to my meeting in a nearby hotel. Nice room,clean,and comfortable. Breakfast was good. All employees were very helpful, and courteous. Room was not cleaned upon arrival. Informed the front desk multiple times about the filthy bathroom. I was told it would be cleaned. It never was.. An additional request was made with the front desk personnel. Still, it was not cleaned. Upon checking out, I mentioned this again to the front desk attendant. He apologized on behalf of the hotel. Very nice place. We arrived early but they let us check in. 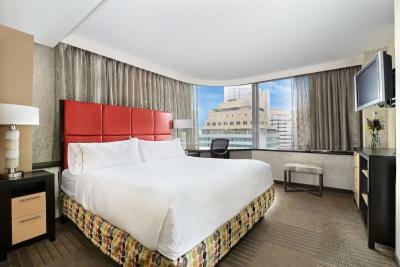 Valet parking and a room with an amazing view of the city. Our room was on the corner so we had a wrap around window. Very quiet and comfy bed. We were only a bock away from most major shopping in downtown Denver. Holiday Inn Express Denver Downtown This rating is a reflection of how the property compares to the industry standard when it comes to price, facilities and services available. It's based on a self-evaluation by the property. Use this rating to help choose your stay! One of our top picks in Denver.Offering a restaurant and a fitness center, Holiday Inn Express Denver Downtown is 10 minutes’ walk from Colorado Convention Center. Free WiFi access is available and a free full breakfast, continental breakfast and a breakfast buffet are offered daily. A work desk, a flat-screen cable TV and coffee-making facilities are featured in all rooms at Holiday Inn Express Denver Downtown. An private bathroom with a hairdryer is also included. At Denver Downtown Holiday Inn Express a business center is available. Union Station is 20 minutes’ walk from the hotel. Denver International Airport is 23 mi from Holiday Inn Express Denver Downtown. 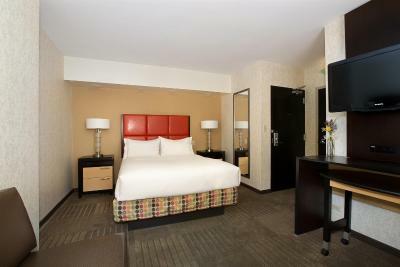 When would you like to stay at Holiday Inn Express Denver Downtown? A work desk, a flat-screen cable TV and coffee-making facilities are featured in this room. An bathroom with a hairdryer is also included. A work desk, a flat-screen cable TV and coffee-making facilities are featured in this room. An private bathroom with a hairdryer is also included. The Holiday Inn Express has recently gone through a 11 million dollar upgrade. Our urban location you will find perfect for discovering all that Denver has to offer or to attend a convention. Parking is Valet only at a fee per night. House Rules Holiday Inn Express Denver Downtown takes special requests – add in the next step! Holiday Inn Express Denver Downtown accepts these cards and reserves the right to temporarily hold an amount prior to arrival. Please note that dogs are the only pets allowed at this property. It's got to do with their billing system. They have completely messed up my reservation and ended up charging me more and wrongfully for my stay there. I only found out when I received my credit card bill upon returning home. They have mixed up my last name with another and ended up with such an incredible mistake. I have written and enquired for the refund, and it is still pending now. The hotel as a whole was good but such mistakes (involving customer's money) should not have happened at all. Painfully slow check in and little to no air filtration accessable in room. Not friendly or helpful. Had to ask to have my room clean. Expensive parking fee. I accidentally made the reservation a week earlier than I wanted. Because the corporation that owns Holiday Inn Express ha a no cancellation and no changing reservations policy, getting them to change the dates of my booking was incredibly stressful. The person at corporate--International Hotels Group (ihg) -- was rude and unwilling to even contemplate just switching the dates, which to me seemed a relatively easy transaction that would result in a satisfied customer. Instead, he babbled on about it not being their policy and blaming everything on Booking.com; he then ranted on about online booking sites. Fortunately, the reps for Booking.com were incredibly helpful and understanding once I told them the situation. They contacted ihg and almost immediately got them to agree to a date change. But ihg wasn't finished. Upon arriving at the hotel, their record indicated I had reserved two rooms, although the confirmation email from Booking.com clearly showed that it was only one room. I am fairly convinced ihg did this on purpose as payback. Once again, Booking.com came to the rescue and fixed the error. A big thank you to Booking.com and your reps, who were courteous and professional. If I can help it, I will never book a ihg hotel chain again. Coffee-maker in the room but no coffee. Double rooms do not all have fridges or microwaves. Front staff were excellent, easy to talk to and to ask questions. Breakfast was great. Hotel location is awesome, good to walk. Due too the storm in Denver i was forced to book here, the price was terribly pumped up, 330$ included taxes for one night. Undersand the opportunity to get more cash in an emergency situation but I can only give a bad reviews then. The price was extremely to high for the value received, small room, tiny bathroom, ultra noisy and badly working air conditioning/heating system. Condition of the room as far as maintenance.